Missing Chemical Indicators: Who’s at Fault? How can we Resolve it? You’ve heard it. Whether you work in the operating room or the sterile processing department, you’ve heard it. It may not happen that often, but when it does it’s a real pain and the accusations start flying. We know that internal chemical indicators are required in every sterile package to confirm that basic levels of sterilization requirements have been met. What we might not know, are the differences in the OR and SPD processes and requirements for placement and use of chemical indicators. Let’s explain. 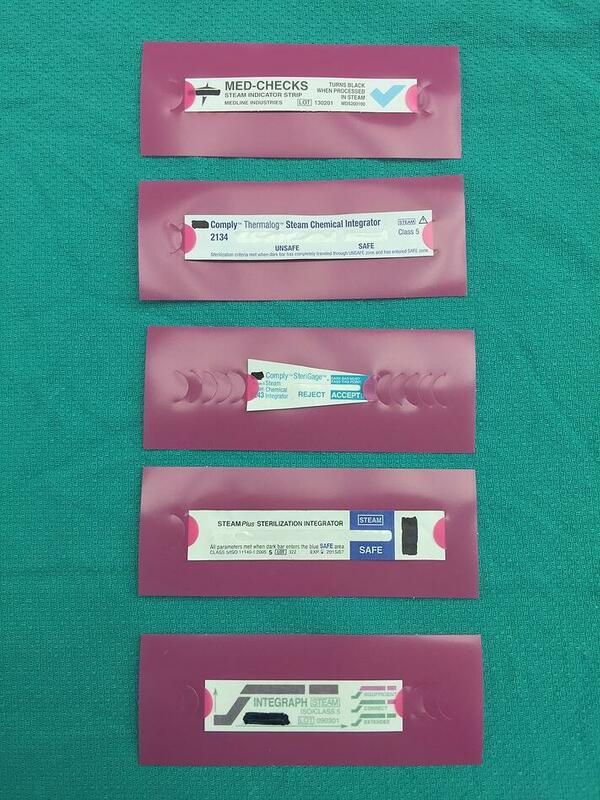 Sterile Processing places internal chemical indicators in every set or pack before being sterilized. The placement location may vary, but AAMI (10.5.2.2.2) recommends that indicators be placed in challenge positions “considered least accessible to steam (sterilant) penetration.” The intent of challenge placement is to confirm that sterilant reached the toughest spots, and therefore likely reached all the other parts of the tray. This is patient safety common sense but it also means indicators can be difficult to locate. The Operating Room needs the chemical indicator in plain sight. They can’t put their hands inside the tray until its sterility is conclusive, so they need to see that the indicator has passed before touching anything inside the set. The scrub tech themselves are sterile, which means that they cannot touch something that is not sterile, otherwise they are considered unsterile and must leave the sterile field. No Bueno! "Missing" Indicators can become a MAJOR issue which results in a great deal of lost time, money, frustration and potentially having to reschedule a case. Yes, occasionally SPD does forget to place an indicator inside a set; mistakes happen. But most of the time there are indicators inside, they just shifted around and became hard to locate. SPD places a bunch of extra indicators inside. Just one may be needed, but sprinkling a few here and there increases the chances the OR will see one of them. The drawback here is the cost of the indicators, which can add up quickly when indiscriminately tossed into sets. This also increases the number of items in the sterile field. Are all the indicators on your count sheet? SPD may twist or weave an indicator through instrumentation in an attempt to secure it near the surface. This can work well for some sets but the process lacks consistency since each set is different. Twisting and bending an indicator can also damage it, rendering the results useless. Check you indicator IFU’s to confirm. Indicator holders are an attractive solution. Designed specifically to increase the visibility and consistent placement of chemical indicators, their super bright pink color makes indicators stick out like a sore thumb. They are compatible with both steam and low temperature gas plasma sterilization and fit all indicator types.